The Pet Sematary remake first look images bring Stephen King's novel to live once more. The novel is one of King's darkest stories, one that he didn't even want to publish originally. It wasn't until his wife Tabitha, and editor convinced the author that he should release the book. It has since gone on to become one of King's most popular works, and many fans believe that it is his best. 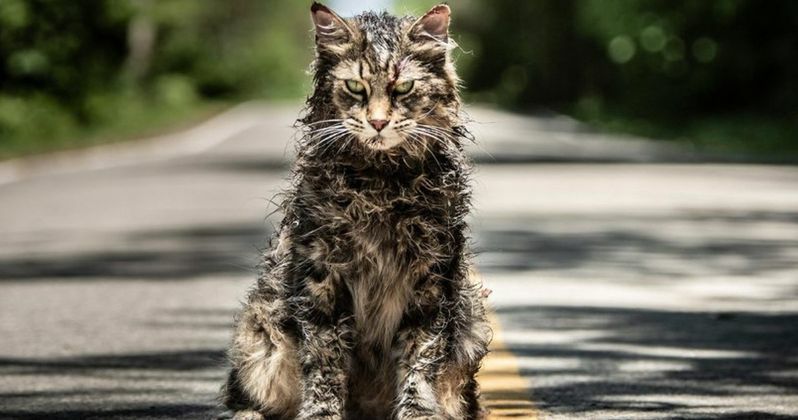 While that point is arguable, the new Pet Sematary film looks pretty disturbingly awesome. Stephen King's Pet Sematary was first brought to the big screen in 1989 and then a sequel was made in 1992, but neither of them lived up to the book. And while some horror fans adore both films, or at least the first, the remake is looking to right some of those possible wrongs and take influence from them as well. Producer Lorenzo di Bonaventura says, "One of the things about doing a new version now is our understanding of life and death has progressed." However, the producer questions whether that's good or bad pertaining to the movie. One of the main themes of Pet Sematary is "How far would you go to see someone again?" according to Lorenzo di Bonaventura. Dr. Louis Creed, played by Jason Clarke in the film, is a physician and believes that he understands life and death. But after he learns of an ancient burial ground that can bring things back to life, he becomes addicted to it. Clark had this to say about starring in the remake. "I found it insanely disturbing. (King) reaches inside you in some way, he always does. There is great intellect and great subconscious and subtext and thought and reason behind it." Kevin Kolsch and Dennis Widmyer (Starry Eyes) directed Pet Sematary from a script written by Jeff Buhler and David Kajganich. Widmyer states that the remake is about "death and talking about death and grief," which is based on reality and then leads us into a crazy chain of events in the film. Kolsch adds that the death of a pet is usually the first way that children learn about death. He says, "It kind of helps you accept death as a natural part of life." Both Kevin Kolsch and Dennis Widmyer use a gambling analogy when talking about the burial ground in Pet Sematary. Even as things are getting worse, one can go back and try to break even. However, things aren't that easy in gabling and they certainly aren't that easy in the remake either. The Pet Sematary remake hits theaters on April 5th, 2019 and stars Jason Clarke as Louis Creed, Amy Seimetz as his wife Rachel, and John Lithgow as the Creeds' new neighbor Jud Crandall. You can check out the first look images from the remake below, thanks to Entertainment Weekly. More pictures of the upcoming "Pet Sematary" movie !